Let's be honest, in many ways, a cappella in and of itself is cheesy. Oftentimes, you're taking a bunch of "choir nerds" (as we've often been called) and harmonizing without the backing of instruments, and making weird sounds with our mouths (beatboxing) for whoever is willing to listen. Flash mobs, singing telegrams, the list goes on....all of it is often associated with a cappella. And while the art has become a bit more hip and mainstream with acts such as Pentatonix, it has not completely done away with the cheese factor. And we've accepted this. 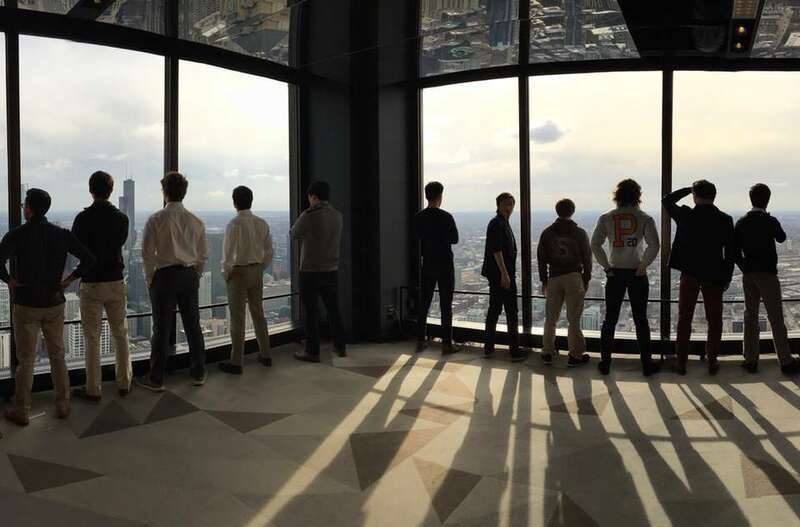 What has become tradition for the all-male vocal group from Princeton University is now under scrutiny in a brand new article by media publication Inside Higher Ed titled "A Cappella and Consent." The article draws attention to the Tigertones ritual of performing the popular Disney song "Kiss The Girl" from The Littler Mermaid at the group's concert. While song selection here is not necessarily the culprit, the associated skit is under fire and has some wondering if the group is promoting a culture of "toxic masculinity" and inappropriate behavior. During the group's regular performance of the number at their concerts, the Tigertones have a tradition of selecting a female audience member to join them onstage as they perform. While onstage, the audience member will often participate in the act by mimicking the Tigertones' choreographed dance moves. Halfway through the song, the Tigertones will then bring a male audience member onto the stage, where they will pretend to groom him, before placing the two volunteers together. By the end of the performance, the Tigertones will beckon the two to kiss, which often resorts in a peck on the cheek, and sometimes a brief kiss on the lips. Most look at the performance as comical or as simply an entertaining moment of the show. Recently, some audience members have complained, citing the skit as being inappropriate and voicing their concerns on whether or not the performance is consensual. Wollstein goes on to raise another major point in that "too many people have felt uncomfortable and violated by this practice." Regardless of your stance on the idea of harmless skits in a cappella performances, this is an issue that should be addressed and not taken lightly. And due to this, the Tigertones have responded. 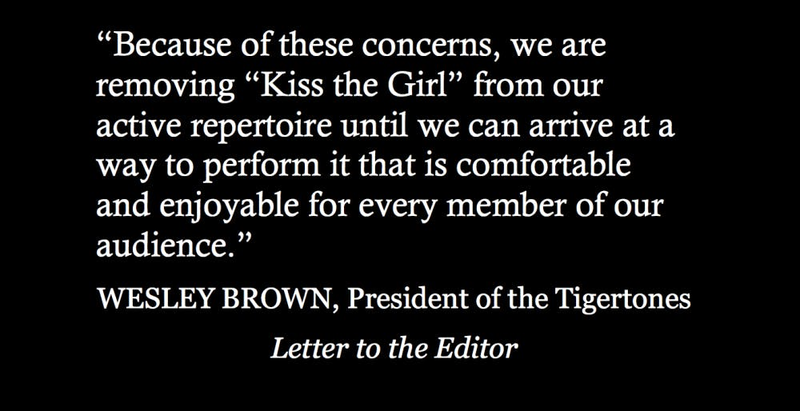 Group president Wesley Brown responded with a letter to The Daily Princetonian focusing on the group's aim of creating "a positive atmosphere through an engaging and energetic performance that is welcoming to every audience member." Brown goes on to cite that the group has held internal conversations for quite some time to address criticisms of the performance. More importantly, the Tigertones want to ensure that "audience participation is more voluntary and consensual." What was once deemed acceptable and permitted in the past is now being met with more questions of its place in today's society. More specifically, artistic acts on college campuses have to be a better fit with today's climate. And it seems that a cappella is not exempt from this. What are your thoughts? Should more groups follow suit in restrictions on concert repertoire or is this simply an over exaggeration to group tradition? To read Inside Higher Ed's full article "A Cappella and Consent", go here.